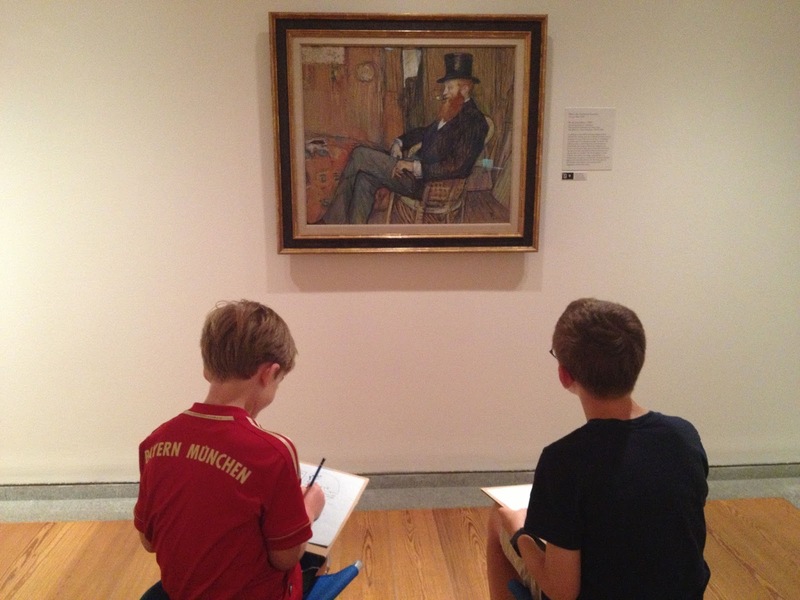 Art museums aren't usually at the top of the little C&Gs sightseeing list, but promise them some sketch paper and colored pencils and they're happy to unleash their inner Picasso. Add in some super lightweight portable stools and off they'll run into the nearest gallery. This summer the Portland Museum of Art is introducing the PMA Art Cart for families, free of charge with your visit to the museum. Every Wednesday from 2:00 to 4:00 and Friday from 3:00 to 6:00 the cart will be in one of the second floor galleries with supplies and stools for your budding artists to borrow. Letting them loose in the museum with a sketch pad and a purpose really helps kids focus on the artwork, and it's always interesting to see what attracts their attention. 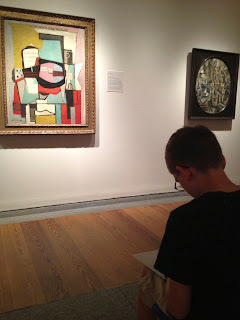 Big C&G immediately plopped down in front of an iconic Picasso, while Little C&G set up shop in front of a small muted colored still life by Georges Braque. Both paintings are in the first floor gallery, where the stunning collection of the renowned collector William S. Paley will be until September 8. The Paley collection is part of a special traveling exhibition on loan from the Museum of Modern Art in NYC, and the Portland Museum of Art is the only stop the 61 paintings will make in New England. 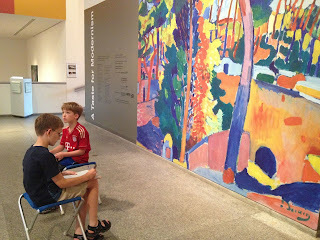 It's definitely a must see, and there are so many works that will appeal to the kiddos. 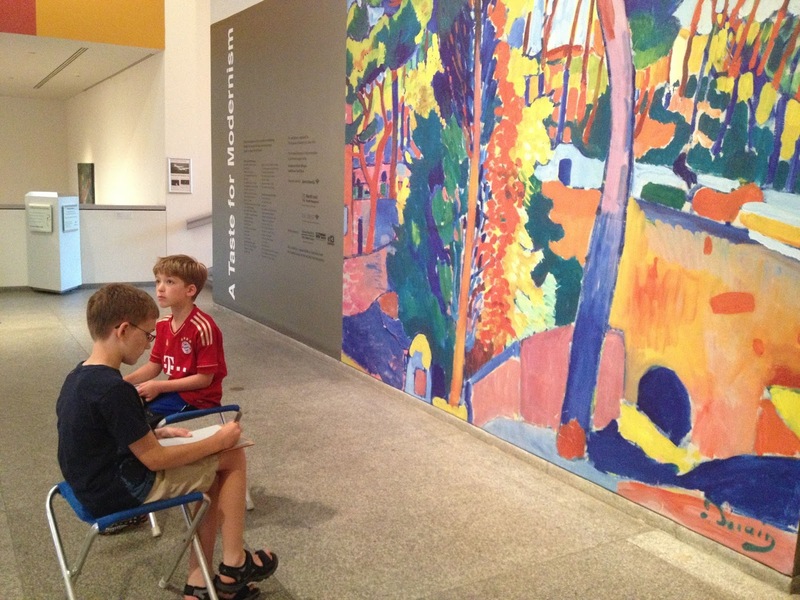 Degas, Matisse, Picasso, Cézanne, and Gaugin will have you thinking you've somehow transported yourself into midtown Manhattan for an intimate and uncrowded look at the European masterpieces. Both boys unfolded their stools in front of a small bronze sculpture they renamed Hulk's Hand, actually a work by Frenchman Emile-Antoine Bourdelle. And the man in the top hat, M. De Lauradour by Henri de Toulouse-Lautrec also got a thorough looking over by my little artists. After about an hour with the world class collection of Mr. Paley, the boys were ready to fold up their stools and go. It was absolutely downpouring when we walked out, otherwise we would have headed around the corner to Otto's pizza to grab a slice and restore our energy. Which we most certainly would have followed up with a ten minute walk over to Gelato Fiasco. The Portland Museum of Art is at 7 Congress Square, and they're open Tuesday through Sunday from 10:00 to 5:00 with a late night on Fridays until 9:00. Admission is $12 for adults, $6 for kids 13-17, and free for the under 12s. On Friday nights from 5:00 to 9:00 admission is free, thanks to some generous museum benefactors. The William S. Paley collection is an extra $5 surcharge, but it's a whole lot less than the $25 admission you'll pay at MOMA to see the collection when it returns home in 2014. For more tips on how to keep your little artists entertained in museums, check out an earlier "Boredom Busters" post I wrote a few months back.